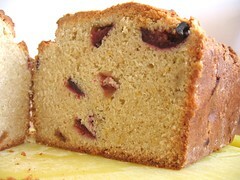 Plum and Cardamom Sweet Bread - Do You Know The Muffin Man? Notes: Italian blue plums are used in this bread, actually, more like a cake. The batter is very thick and dense, and makes a full 9"×5" loaf. Wonderful combination of flavours: orange, plum and cardamom.